"Cpr Summer And Winter Tracks Near Glacier". 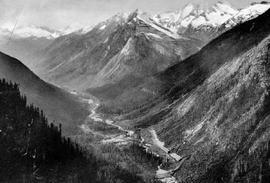 "Mountain Creek Bridge, showing Beaver Valley, Summit of Selkirks, BC." "Station at Revelstoke, CPR ". 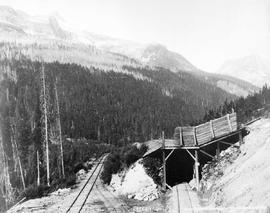 "The Loop, CPR, Selkirks"; Canadian Pacific Railway. Approximately 10 kilometres south of Golden; looking from the east bank of the Columbia River to the Dogtooth Range of the Purcell Mountains. Burgess Pass, Yoho National Park; Emerald Lake and Mount President. Canadian Pacific Railway Engine No. 315 At Rogers Pass. Canadian Pacific Railway Loop In The Illecillewaet Valley. Columbia River Canyon, Near Revelstoke. Double loop, Canadian Pacific Railway, Selkirk Mountains. Farm View South Of Revelstoke; Mount Begbie In The Background. Great Glacier at Glacier House, BC; Trueman No. 3087. Hermit Range from Glacier House, Selkirk Mountains, Bailey and Neelands No. 651.